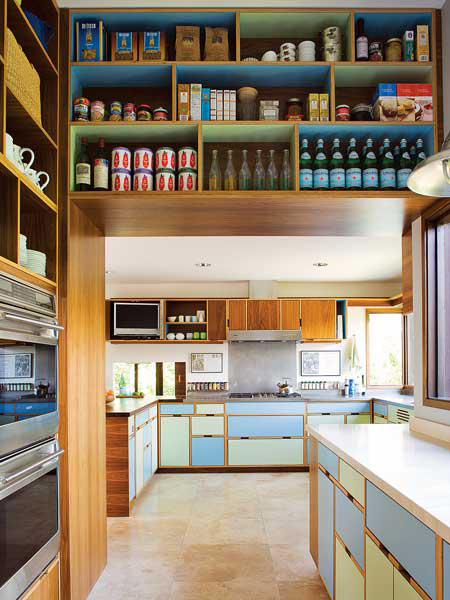 While visiting and writing about small homes for our June 2009 “Think Smaller” issue, it quickly became clear that when space is sparse, the best way to get the most bang for your buck is with built-in shelves and cabinetry. Anderson Remodel by Shed Architects. Custom cabinetry by Kerf Design. Photos courtesy of the architects. Anderson Remodel by Shed Architects. The pantry and laundry room looking into the kitchen before the renovation. Photos courtesy of the architects. Anderson Remodel by Shed Architects. 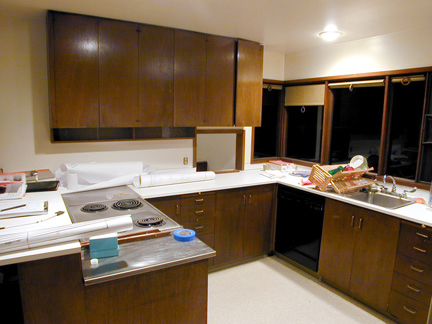 The kitchen before the renovation. Photos courtesy of the architects. Although the Anderson house in Washington state is not small—it measures in at a whopping 3,980 square feet—the 1964 home originally designed by Seattle architect Ibsen Nelson was plagued with a cramped kitchen and a small, dark master bathroom. To brighten and open up these areas, the residents hired Seattle-based Shed Architects to do a renovation. The biggest trouble spot was the kitchen. 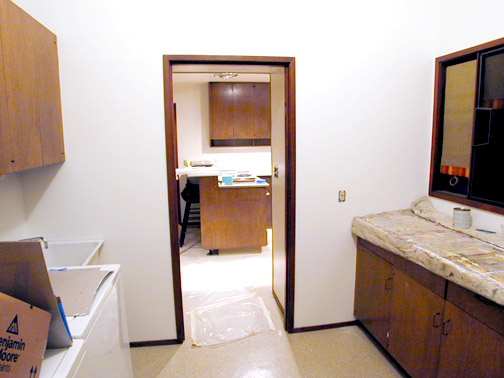 The architects used the adjacent laundry room and pantry as an opportunity to increase the space in the kitchen without adding additional square footage, by opening up the wall between the two zones. Joining the rooms had the additional advantage of highlighting the existing high ceilings and maximizing the natural light that comes in through the band of windows. To create the stunning cabinetry that lines—and dips into—the walls, Shed brought on board Kerf Design, a custom furniture and cabinet shop also based in Seattle. In the former pantry and laundry room, cabinets and cubbyholes store dry goods and special-occasion tableware. In the kitchen, built-in shelves next to the fridge create space for displaying toys and trinkets as well as an eat-in library. 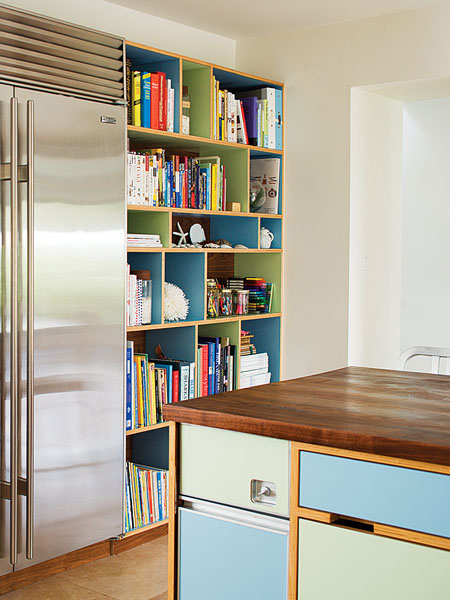 The original and new kitchen areas are visually connected through the green and blue cabinets that brighten the atmosphere as well as by the continuous countertop that weaves through the space. The counter materials vary according to function across the uninterrupted surface: The eating area is made of solid walnut, the cook top and sink are surrounded by stainless steel, and the baking zone is finished in honed limestone. 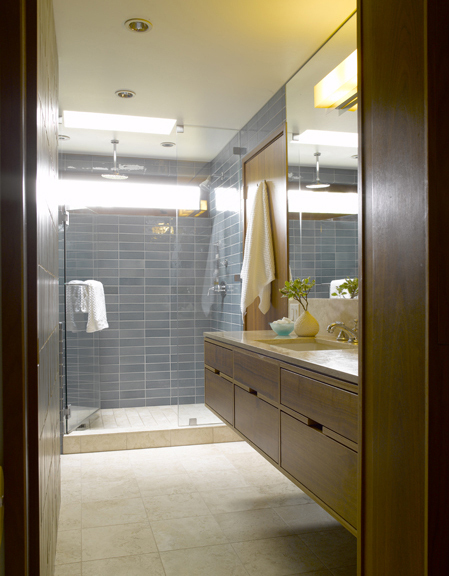 In the bathroom, a similar two-into-one room conversion opened the space and made it more functional. In this case, the architects combined the master bathroom with the powder room. 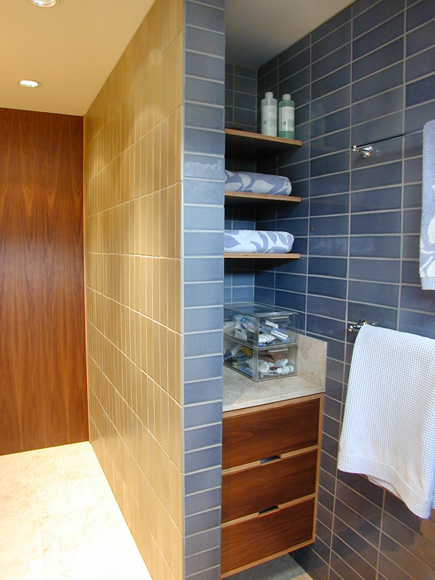 Kerf Design created cabinets in the tucked-away, hard-to-reach places in the bathroom to increase useable space. For more images of the Anderson house remodel, click the “View Slideshow” button at the top right-hand corner of this post.